Okay, so you’ve mastered Super Crate Box, and you’re so good at Super Hexagon that you can’t play it anymore without yawning. And maybe you’ve also bested a Sasquatch at arm-wrestling, and you’re the King of the Oompa-Loompas because those two things are just as likely. 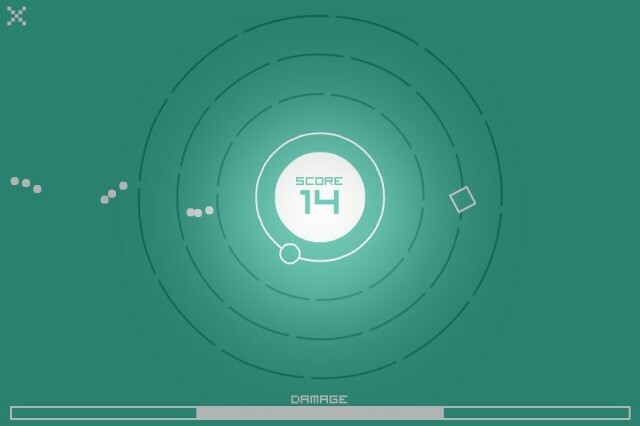 But if you like those other games and are looking for something “inspired by” them, you’d do well to check out Atomic+, a recently released arcade/twitch/minimal title that puts you in the position of an electron that can leap between atomic orbits and has a lot of stuff flying at it constantly. So maybe not quite like an actual electron, but you get my point. Atomic+ is about reflexes and timing and learning to cope with the failure and unfairness that plagues this crazy world of ours. You control a dot orbiting a nucleus, and your job is to pick up as many squares as you can while avoiding all the crap that’s constantly emanating from the center of the screen. You have three control schemes to choose from. “Auto” has you holding to increase your dot’s radius and releasing to let it fall back toward the center. “Manual” lets you tap left to move outward and right to move back in. And “Full” lets you control both the radius (using the “Auto” method) and direction (in the other two systems, your dot changes direction every time it picks up a square). All of them have advantages, but I preferred the Manual setting. Atomic+ is about reflexes and timing and learning to cope with the failure and unfairness that plagues this crazy world of ours. A damage meter at the bottom of the screen fills as you take hits, and you can buy yourself more life by picking up squares. It’s a simple game that’s quick to pick up and not so challenging that you’ll want to throw your phone or tablet across the room. But it’s tough enough that rounds won’t typically last longer than a minute or two. 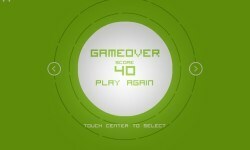 The Good: Quick, addictive, simple game with a good level of challenge; Agent Whiskers’ music is pretty great. The Bad: Those f***ing dots always know where I’m going to be. The Verdict It’s worth your time if you don’t mind a bit of railing against the cruelty of fate and impossible-to-avoid pixels that run your perfect run.